I just returned from Hampi today morning and I have no words to describe this delightful visual treat. Physically I am here but I am missing the sight of the wonderful architectural stonework, feel of air of the Hampi which bears testimony to the fact that it was ruled by greatest of emperors and speaks impressively about the culture and rich history of the place. There is nothing more amazing in the world than boulder-strewn landscapes, royal ruins, mystic monuments, giant temples, great lakes and Banana and coconut plantations of Hampi. Once you entered in this village, you will feel like that you entered in the different era where the time is frozen. It is very small village and all the people are very friendly. I lived there for 2.5 days and it seems that I have made good number of friends. People have recognized me well and greets every time we happen to cross each other. Since it is a small place, you will easily come across same sets of villagers again and again. It is quite an offbeat destination among Indians and as far as I remember, we were the only Indian tourists. However, it is quite famous among foreigners. Hampi Bazaar reminds me of Palolem Bazaar in South Goa. Hampi, A UNESCO world heritage site, was the capital of Vijayanagar Empire. It is situated on the banks of Tungabhadra River in Karnataka, the majestic ruins of Hampi’s emperors, temples and royal buildings speak powerfully about the wealth and magnificence of the Vijayanagar Emperors. The capital of the Vijyanagar Empire from 1336 to 1565, the city was ruled by four dynasties – Sangama, Saluva, Tuluva and Aravidu dynasty. There are more than 500 monuments built by different rulers. 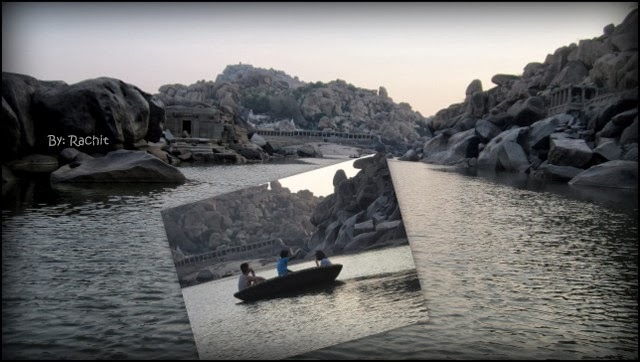 Also, it is believed that Kishkindha region which is mentioned in the epic Ramayana is in Hampi only across the Tungabhadra River. Kishkindha refers to the monkey kingdom. Sugriva, the younger brother of Vaali, is mentioned as the ruler of the forest-kingdom Kishkindha. Also, Anjaneya Parvat which said to be birthplace of Lord Hanuman is situated in Kishkindha. Also, Shabari Ashram is believed to be at this place. Foreigners generally use the word “Monkey temple” for the famous Lord Hanuman temple which hurts many Indians. What to expect in Hampi? I will come up with my detailed itinerary and series of blogs for Hampi covering all the details which I didn’t able to get while planning for my trip in coming blog posts. I would recommend complete 2 days for this place. You can reserve 1 day for visiting royal ruins, ancient temples and monuments and you can reserve another day for visiting sites like Kishkindha and Birthplace of Lord Hanuman which are across the river. Also, you can use Coracle boats to cross the river which is an experience in itself. One can also cross river using mechanized boats which are much cheaper in terms of money and time but prefer them only if you want to take your bike/bicycle/rented 2 wheeler across the river. Coracle boats and steamers start from different places and there are regular autos between these places and will take around 10 minutes. Also, one can rent a bike/bicycle across the river. There are good numbers of restaurants in Hampi and the best part is that they are very close to each other. I have explored around 9, 10 restaurants and will write a different post on that. I am sharing this short trailer which will give you the highlight of what to expect in the upcoming write-ups on Hampi. Thanks Arti for your precious time and comment.